The right elbow transitions from hinge to lead during the swing. When you assume your stance and are addressing the ball, your right arm is fully extended along with your left arm to hold the club in place behind the ball. Your right arm should be at a 45-degree angle from the body in a position that makes holding the club feel comfortable. Your right arm acts as a hinge on the backswing. Much of the motion of the backswing is done by the pushing of the left arm. 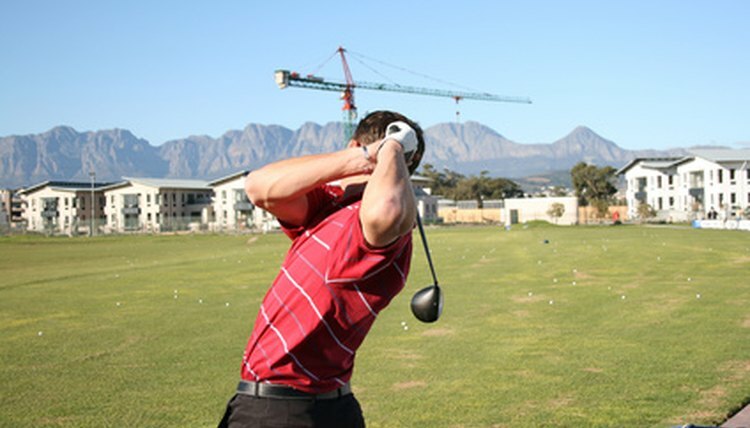 Keep your right elbow pointed down throughout the swing, and keep your right arm close to your body. Let it get away and you lose control of your shot. While acting as the hinge, the right arm's job is to maintain the straight path the club will follow throughout the swing. If it doesn't maintain a tight circular radius with the elbow pointed down as much as possible, the club will get away from the body and the shot will go astray. When the club reaches a parallel position over the golfer's head at the top of the backswing, it is time for the right arm to be the power arm and the left to be the hinge. The right arm should follow same path down that it followed in the backswing, and it will be dragging the club slightly behind it. On the downswing, it is the right arm that should be pulling the club through impact and creating power. Once again, a tight radius needs to be maintained between the right arm and the body in order to ensure that the club swings in straight path. On contact, the right arm and the left arm are straight again, and the right is pushing the club through impact, continuing through to the follow-through and providing the power generated by the momentum of the swing. Any sudden movements by the right arm at the point of contact can meet with disastrous results. To underline the importance of the right arm in power process of the swing, you might notice that if you swing incorrectly and make bad contact, you get a sharp stinging sensation from the club to your hands, with most if not all of the pain in the right hand. The right arm continues to push the club through the follow-through until it rests the club safely on the left shoulder. At the end of the follow-through, the right elbow is pointing straight down to where the ball was, and the right hand is at the base of your neck.